We’re starting out the New Year, and people always like to make resolutions to get the New Year started. Sometimes I think we make too many resolutions, or we make ones we know we’re not likely to keep. I think it’s better to make just a few, and have them be things we genuinely believe will make our lives better. I’d like to challenge us this year to do something really simple. I’d like to challenge us to change the character of Springfield. I’d like to see us be more of a praying community. I know that many of you do pray. You’ve told me that you do, and I believe you. Many of you pray privately, at home, in your family, or during the week when you’re going from one place to another. But we don’t pray that much together. We don’t always feel comfortable, praying out loud. Our Scripture to start out the New Year is about prayer. It’s from the gospel of Luke, and Jesus talks about not only what to say when we pray, but he also talks about how we feel about praying. He talks about confidence, and he talks about asking for whatever we need. Let’s listen to what Jesus says. Then Jesus said to them, “Suppose you have a friend, and you go to him at midnight and say, ‘Friend, lend me three loaves of bread; a friend of mine on a journey has come to me, and I have no food to offer him.’ And suppose the one inside answers, ‘Don’t bother me. The door is already locked, and my children and I are in bed. I can’t get up and give you anything.’ I tell you, even though he will not get up and give you the bread because of friendship, yet because you keep on asking, he will surely get up and give you as much as you need. “Which of you parents, if your child asks for a fish, will give them a copperhead instead? Or if your child asks for an egg, will give them a scorpion? You know, people loved Jesus for a lot of reasons. They loved him because he helped them. People who were sick, came to Jesus, and he prayed for them, and they were healed. People also loved Jesus because he fed them. A whole lot of people were very poor back in Jesus’ time, just as there are lots of poor and hungry people in the world today. He sat them down, and he gave a word of thanks, and there was food enough for a big crowd, with lots left over. People loved Jesus because he told them they were forgiven. The burden of carrying something you did wrong, the burden of other people hating you, the burden of carrying around old mistakes for years – Jesus helped people to be free from those burdens and live again. People loved Jesus because he set them free. People loved to hear Jesus pray! They came from many miles away to hear Jesus’ prayers. He blessed them. He blessed their children. Jesus’ prayers gave people hope. His prayers made them feel that God was listening. He always told people that God loved them, and that he loved them, too. But Jesus never said that he was the only person who could pray. He never said that! On the contrary, Jesus expected, and he still expects, that all of us will pray. And I said, “No.” I thought they were all going to fall right out of their chairs. I go to Circle almost every month, and sometimes I say the prayer at meal time, but often I ask for someone else to take a turn. And you know, a lot of people here are very good at saying grace. Turns out that’s something anybody can do. Every one of us can give thanks to God for our daily bread, just the way Jesus told us to do. I pray a lot when I go to visit people in the hospital, when they’re sick or hurt or lonely. It’s not because people can’t pray. But when you’re sick or hurt or lonely, sometimes it really helps to feel that someone else is praying for you. 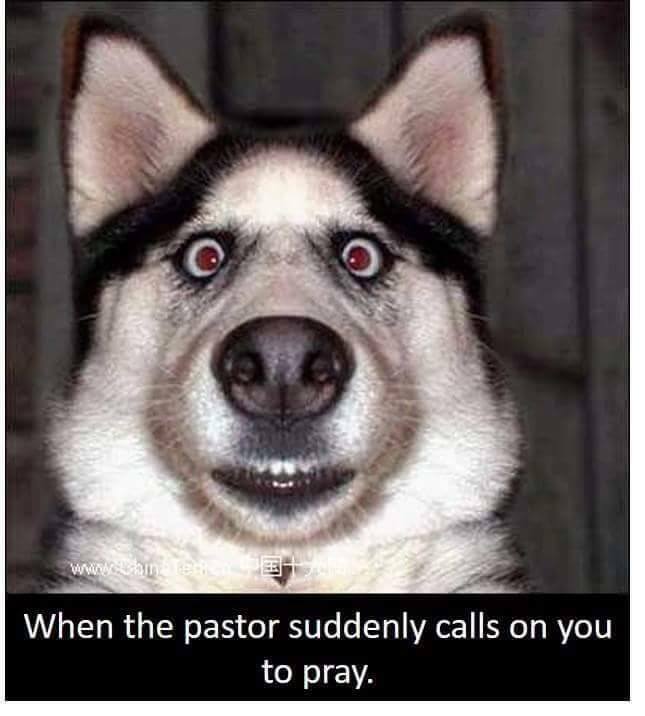 Or sometimes people ask to have me pray, because I’m representing the whole church, and it helps the person to feel that the rest of the church is there with them. So I pray at people’s bedsides, or I hold their hand and pray while they’re lying back in a chair, or once in a great while we’ll kneel down together. Whatever helps people to feel better. Whatever helps their confidence, their trust that God is here with us, that God cares, that God is listening. And I pray a lot silently, even in the middle of a conversation. And both my wife and I pray a lot for you all at home. But nowhere does it say that only the pastor prays. You won’t find that anyplace in the Bible! My prayers aren’t any better than your prayers. My words aren’t more beautiful – some of you pray much more beautifully than I do. I’m quite sure that God doesn’t listen to my prayers more attentively than God listens to any of your prayers. So, point #1 for the New Year – we all need to pray. I’m very glad to pray if it will help. But everyone can pray, and I think the church is stronger if everyone does pray. I would like to challenge you all, today, to take your turn praying. If you listen to Jesus, he makes it all very simple. The Lord’s Prayer is one which every one of us can say. I think we ought to say it more often. It’s OK to make up our own prayers. Use your own words, for sure! But if you’re stuck, the Lord’s Prayer is always a great one. Then Jesus says, “But God really loves you! God loves you so much more than your lazy friend does! God will come running, even before your finger touches the door bell!” That’s how prayer works. God comes running to meet us. That is one of the biggest promises in the gospel, and it’s one we should take full advantage of. If Jesus tells us to ask, we should be asking. If Jesus tells us to look for answers, we should be seeking everywhere. If Jesus tells us to keep knocking on the door till we wear a hole right through it, we should keep knocking. That’s one of the things that bothers me about our meeting. We spend way too much time being anxious, when we should be praying instead. I don’t care what the subject is – whether it’s our budget, or the number of people we have, or the time and energy people have, or the resources we need. Jesus says, “God wants to help you! God wants you to grow up and be strong! It’s just like being in a family. If one of your kids asks you for something healthy to eat, are you going to give them something awful? Of course not! You love your kids. You give them the best you have! This isn’t something new. It’s an attitude change on our part. Jesus says to pray. Pray simply. Pray for whatever we need. Pray with trust and confidence, that God indeed loves us. Pray, and keep praying. Don’t give up! Keep asking, keep looking, keep knocking on the door. Knock all night long if you have to! Don’t stop! I want us, in this New Year, to be different. I want us to be more of a praying community. I want all of us to take responsibility for praying, for all the things that we need. I’d like us to be a little more imaginative and daring in prayer. I’d like us to try praying for things that are wildly out of our reach. God is tall enough, God can reach to that top shelf. God has infinite resources, and most of all, God wants to help. So let’s ask! Let’s stop being so anxious, and pray more. Let’s stop living in doubt, and pray with trust and confidence. Let’s pray for the things we need, and rejoice that God is listening! It’s an attitude thing. Outside my office, in the hallway, I’ve got a little bulletin board. I like to put up cartoons and funny things to make people laugh. Right in the middle, there’s a picture that I got off the internet. It’s been up there for quite a few months now. Everybody laughs when they see the cartoon,but it’s always kind of a nervous laugh. I want to do something different this year. I want to dare you to pray. In every bulletin this morning, there’s a little yellow piece of paper. It’s got space for different things that you really want to pray for. It’s not a “should” list. It’s to write down things that you yourself want most, what you need to pray for. I hope you’ve been filling it out during worship this morning. I’m going to ask Anna to play for a couple of minutes now, and I want to dare you to finish filling out whatever spaces you want. Then I want you to get up, out of your seat, and bring your prayers down front. That’s all. I’m not going to ask every person here to pray out loud. But take that first, little, inchy-squinchy step of writing down what you really want, and bring it down front. Let’s do that now. Write your prayers out, and bring them down. Now I want to do one more thing, that may be a little outside everyone’s comfort zone. Earlier this week, I asked the leaders of the meeting to pray – the officers, the teachers, the group leaders. Could be something to do with their special responsibility, or the ministry that they focus on. Could be a prayer for the whole meeting. But part of leadership – maybe the most important part of leadership – is prayer. If we want to be blessed, we need to pray more. So, I’ve asked our meeting leaders to pray. For the coming year, let’s be bold in prayer! Keep on asking, keep on seeking, and especially keep on knocking. Remember that God loves you, and that God wants to help you! May God bless you in this New Year, and remember that God is always listening to your prayers.